AUBURN – When Min Carter talks about herself, the first thing she talks about is her independence. She comes back to it frequently when she is asked whether her course of study was difficult or when she is asked about the pressures of pursuing an advanced degree at Auburn when her husband and daughter live so far away. It is her independence, she thinks, that makes these things possible. She credits her childhood with instilling this extraordinary degree of self-sufficiency. Her mother, she says, was in a forced labor camp during the “dark time in Chinese history.” Dr. Carter lived with relatives during her early years, shuffled about from grandparents to aunties until her parents returned home when she was eight years old. Even with their late arrival in her life, they were a huge influence on her priorities. Her parents, she says, considered their work first, and family came second, perhaps. They gave her their work ethic, their respect for education, and her independence. Considering her career, Dr. Carter’s work ethic is indeed formidable. She began her career as a mechanical engineer, graduating with honors from one of the top universities in China. She worked in the field as an engineer, an engineering consultant, and an instructor before moving into a position as a management consultant. This last position fired her interest in management, and she moved to Australia with the intention of improving her English in order to study in the US. During this time, Dr. Carter never lost sight of a goal that she conceived as a child. She looked at her parents careers – her mother was a medical doctor and her father an engineer – and determined that no matter what career path she took, she would obtain the highest possible degree in that field. With her sights set on business as her field, it took nine months of diligent study in Australia to improve her English enough to apply to business schools in the US. The place where she landed was Troy University in Alabama. 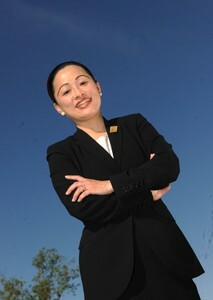 After completing an MBA there, she worked as an international site coordinator. She worked to deliver courses and ensure smooth operations for satellite campuses in India, China, Malaysia, Ecuador, and Vietnam. She gained incredible experience, but would not be satisfied without pursuing that terminal degree. When Dr. Carter began looking for a place to pursue a Ph.D. in Management, Auburn University was one of the first that she considered. She liked its reputation and its closeness to her husband, who stayed in Troy, and later in Birmingham. After reviewing faculty profiles provided by the department, she was certain that Auburn was the right place for her. Dr. Carter’s dissertation research is ambitious, like the scholar herself. She sought to add to the body of research concerning management theory in both Western and Eastern societies. In keeping with her ambitious nature, Dr. Carter actually began dissertation research after her first year of doctoral study. With the support of her advisors, she conducted a pilot study that included the core values of what would become her dissertation research. The result is that she graduate early and two manuscripts drawn from her dissertation have been accepted for presentation at a major national conference.. The subject of Dr. Carter’s investigation, briefly, is the effectiveness of leadership during times of organizational change. She sought to answer questions still unanswered in the US research on leadership and organizational change, as well as to see whether this theory can be extended to eastern societies, such as China. She collected her data from two companies in China who were in the midst of organizational change, and studied the success of two management theories within that context. The two kinds of leadership she studied are called transactional and transformational leadership. These two theories have dominated the field for over two decades, according to Dr. Carter. Briefly, transactional leadership involved clear goals set by leaders for followers, with rewards exchanged for performance. Think salary and bonuses. Transformational leadership builds on the idea of rewards for performance, but adds to it an idealistic component. It focuses on treating employees as individuals rather than a group, and attempts to communicate a “compelling vision” to employees, so that everyone feels inspired to treat the organization’s goals as their own. Because Chinese power relationships and cultural factors are different, Dr. Carter says, it was unclear whether theories established in the US and other “Western” societies would hold true for Chinese companies. Would the cultural differences be too significant for western leadership styles to be effective? Not really, she found. Though some small differences in implementation might be necessary, Chinese management leaders could train in western management theory without having to substantially change it to suit Chinese culture. One of the underlying questions that Dr. Carter feels that her research answered was why transactional and transformational leadership are effective. Though these theories have held sway for so long, she felt that this basic question was still largely unanswered. Her answer? Organizational justice. In other words, these two styles of leadership create a sense of fairness that makes workers happy. When there is a perceived sense of fairness in reward distribution and the decision-making process, leadership is more effective. Currently Dr. Carter is a post-doc research fellow here at Auburn University, and is not in a great hurry to leave, though her appointment expires next summer. She will continue to work on research, mainly with her committee members Dr. Armenakis, Dr. Field, and Dr. Mossholder, and chiefly in the fields of leadership, social exchange, organizational justice, and cultural values orientation. She asked, in her appointment as a fellow, that she be allowed the opportunity to continue teaching. Dr. Carter’s engineering background influences her teaching style. She encourages her students to take a rigorous scientific approach to the study of management. An engineering student recently thanked her for this, saying Dr. Carter’s class was the first to convince her that management is a science, not simply a study of successful organizations. When asked what the future holds, Dr. Carter is uncharacteristically vague. She will begin looking for faculty positions starting in fall of 2011. Her husband, she says, is ready to move where she finds a position. Another change for Dr. Carter is looming: Her daughter, who has been studying at a prestigious boarding school in China, will begin her first year at Birmingham Southern College in fall of 2010. Dr. Carter allows herself a moment of pride as she explains that her daughter recently faxed her resume, which is already four pages long and stuffed with activities, awards, and honors. This is another reason, Dr. Carter says, that she was glad to stay at Auburn as a postdoc rather than rush to the job market. She will be able to make herself available to her daughter in her first year of college. It is easier than it once would have been to live with her daughter so far away. With phone plans and Internet communications, she’s able to stay in close contact with her daughter. Next year she will possibly be in a new place and on to a new challenge. Dr. Carter says that she is eager to continue her research and to learn where she can make contributions. There are so many questions that need to be addressed and answered both in western and eastern societies, she says. She quotes Dr. Anne Tsui, a noted scholar in International Management: “China is a large intellectual puzzle with not thousands but millions of pieces that have to be put together.” But for now, Dr. Min Carter will go on holding up her half of the sky.